Now it’s time to pair your trackpad acumen with the El Capitan Finder window on your MacBook. Follow along with this simple exercise. Move the pointer over the iTunes icon in the Dock. (This icon looks like a circle with a musical note on it.) Then tap the trackpad once. Whoosh! 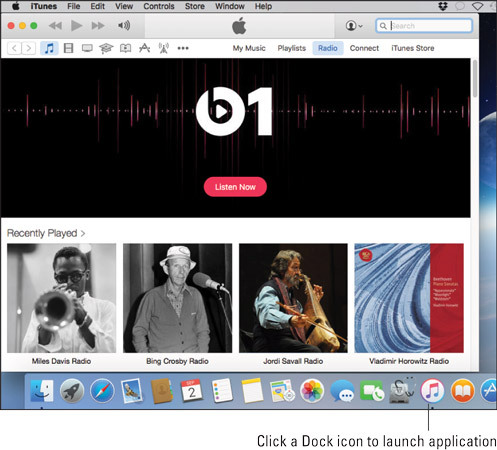 El Capitan launches (or starts, or runs) the iTunes application. Click a Dock icon to launch that application. If an application icon is already selected, you can simply press ⌘+O to launch it. The same key shortcut works with documents, too. From the Apple menu: You can launch a number of applications from anywhere in El Capitan using the Apple menu. Click System Preferences to change all sorts of settings, such as your display background and how icons appear. Click App Store to launch the OS X App Store and display software that you can download for your laptop. You can also use the App Store to see whether update patches are available for your Apple software. From the Desktop: If you have a document you created or an application icon on your Desktop, you can launch or open it from the Desktop by double-clicking that icon (tapping the trackpad twice with one finger in rapid succession when the pointer is on top of the icon). Double-clicking a device or network connection on your Desktop opens the contents in a Finder window. This method works for CDs and DVDs you’ve loaded, as well as external drives and USB flash drives. Just double-click ‘em to open them and display their contents in a Finder window. Applications and documents typically launch from a CD, a DVD, or an external drive just like they launch from your internal drive (the one that’s typically named Macintosh HD). From the Recent Items selection: When you click the Apple menu and hover the pointer over the Recent Items menu item, the Finder displays all the applications and documents you used over the past few computing sessions. Click an item in this list to launch or open it. From the Login Items list: Login items are applications that El Capitan launches automatically each time you log in to your user account. From the Finder window: You can also double-click an icon within the confines of a Finder window to open it (for documents), launch it (for applications), or display the contents (for a folder). The OS X Quick Look feature can display the contents of just about any document or file — but without actually opening the corresponding application! Sweet. To use Quick Look from a Finder window, click a file to select it, and then press the spacebar. Press ⌘+Q. This keyboard shortcut quits virtually every Macintosh application. Just make sure that the application you want to quit is currently active first (the application name should appear immediately to the right of the Apple menu). Choose the Quit command from the application’s menu. To display the Quit command, click the application’s named menu from the menu bar. This menu is always to the immediate right of the Apple menu. For example, Safari displays a Safari menu, and that same spot in the menu bar is taken up by Calendar when Calendar is the active application. Choose Quit from the Dock. You can right-click an application’s icon in the Dock and then choose Quit from the menu that appears. A running application displays a small dot under its icon in the Dock. Click the Close button in the application window. Some applications quit entirely when you close their window, such as the System Preferences window or the Apple DVD Player. Other applications might continue running without any window, such as Safari or iTunes; to close these applications, you have to use another method in this list. Choose Force Quit from the Apple menu. This is a last-resort measure! Use this method only if an application has frozen and you can’t use another method in this list to quit. Force-quitting an application doesn’t save any changes to any open documents in that application!